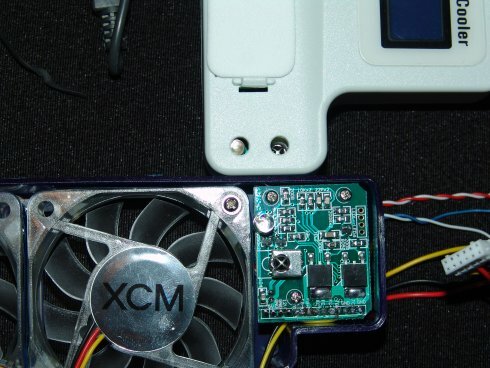 This week I have had the fortune of having an Xcm Air Cooler, and the Addon Fan come across my work table. A big thanks goes out to Xcm for supplying the product for review. 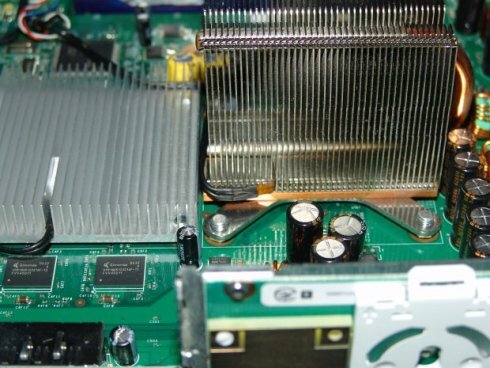 I know there have been some questions raised in the forums, and other places on the web pertaining to the heat build up that seems to plague the Xbox 360. With llamma getting their hands on a Xbox 360 Elite, and reporting their finds, it seems that the heat issue may still be of great concern. Microsoft seems to have only added some highly dubious updates to the Cpu and Gpu to try and avoid the dreaded 3 red lights. They put a dabbing of epoxy on the Cpu and Gpu in attempts to keep the bga connections from popping once the board warps under heat. As llamma has stated “will it work we have our doubts” which I couldn't have said any better myself. There also seems to be the likely chance that Microsoft has rolled out the 65nm chips for the elite. This is unconfirmed, but looks highly plausible, due to the decrease in capacitors surrounding the board. Which points to lower power consumption. With lower power consumption comes less items on the motherboard to produce heat. I haven't had the chance to get my hands on an Elite to do some temperature comparisons, as well as seeing how much power consumption has decreased. Lets hope someone that obtains an Elite will do so, and I can post the results and finally confirm or deny this. Now you may be asking, why am I reading all this background information if your just reviewing an aftermarket cooling solution? Well the reason being is you have invested some hard earned cash in your 360, and like me probably want to take as best care as possible of it. Now I wanted to let you all know of the heat issues, and show that there is a great need to purchase some type of aftermarket cooling, to prolong the life of your investment. I have had no problems to date with my 360, but after installing this, I have great piece of mind, and its great to have control over how hot your system gets. You have to remember that this system rivals some gaming computers out there at the moment, and does so in a much smaller form factor as gaming computers. So if your like me and worry about your investment read on and see what findings I have had with and without the Xcm Air Cooler, and Addon Fan. I have to say that this was extremely easy to install, and very straight forward. The package comes with the fan, a dismantlement tool, installation instructions and, the lcd display unit. Everything came in great packaging, and worked with no problems. Mind you they sent me this to review from Hong Kong, and I live in Arizona. Before I started the installation process, I examined the parts. 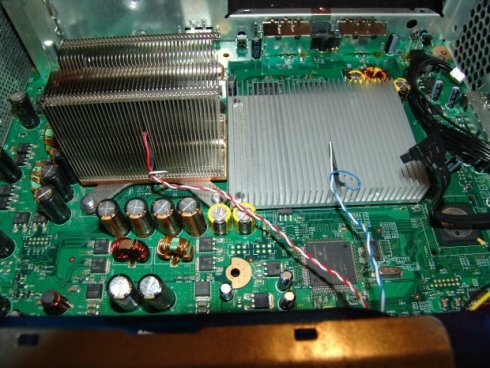 I seen what I thought was some type of sender and receiver unit both on the lcd unit, and fan unit. I dug a little bit into the installation instructions and came across how the fan and lcd unit communicate with one another. There is a remote control unit on both devices and they communicate this way. I thought perhaps the lcd unit did so somehow via the Usb connection. I was stumped how they would do so, but once I found the receivers, I have to say this is very effective, and forward thinking. Why have wire connections when you can send it via rf. The construction of the unit, is very solid. I have no doubts that it is built to last. I've come across some other products in the past that worried me a great deal due to construction. But Xcm seems to build their products with strength in mind. The lcd unit matches the feel and look of the Xbox 360's case, and is a welcome sight on the back of your Xbox 360. It displays temperature's and allows for fan adjustment. It is very easy to use, and adjust. If I hadn't of been taking pictures, and taking my time, I could have installed this unit in short order. The dismantlement kit they send you, saves you a lot of time and hassles. I have taken my 360 apart more times then I'd like to remember. I have a few tools that helped me out with taking the 360 apart, but with this tool the process is extremely easy to accomplish. Even if you don't pick up this unit, I recommend purchasing the dismantlement kit if you take your 360 apart often. One of the few things that I didn't like about the unit, was the heat sensors. The units are large, and installing it into the cpu heatsink fan grill wasn't something I can agree upon. It doesn't allow you to place the sensors very far from the fan unit, and the way its installed in the heatsink grill bothered me. So I added on my own heat sensors, and placed them at the front of the Cpu heatsink, and Gpu heatsinks. Id rather get an ideal of my temperature's before air is passed over them to cool the unit. Do I think perhaps I went a bit overboard. Not really, I have built many computer's in my time, and always had heat sensors all about the case. I really like having control of where I place these, and how. But the supplied heat sensors, will do the job as good as mine, I'm just very picky about how my projects look. Don't be afraid of my findings. You can install it the way recommended and still achieve what Xcm wanted. If your like me, and like having a bit more flexibility with your placement, read my tutorial and I show how I went about modding this aspect of the Xcm. Mind you this was the only mod I had to preform on this unit. The rest of the installation went without a hitch and I was pleasantly surprised at how easy this was. I have written a tutorial on how to install this, and you can give it a gander and see just how easy it is to install this product. Now to my findings. I tested the 360 before and after using heat sensors, the first time around I used my own, and the second time I used the Xcm's supplied heat sensors. The placement of the sensors was exact for before and after. The results are very surprising. After an hour of Oblivion I achieved 146f or 63c on the cpu, while obtaining 125f or 52c. I actually googled after this, and found my findings to be almost exact to other heat prob findings. I find it uncanny they also used Oblivion. It is the only game that has really pushed my 360. Gears of War has, but Oblivion is non stop rendering, which I thought was important for this testing. These are stock cooling temperature's. Now on to the testing of the Air Cooler, and Addon Fan. After an hour of Oblivion play, with the fan on auto, I obtained 106f or 41c on the cpu, while achieving 122f or 50c on the gpu. As you can see, the difference between the stock cpu temperature, and the Air Cooler/Addon Fan temperature is very impressive. I was able to knock off 40 degrees f, or 22 degrees c. The gpu only netted 3 degrees f, or 2 degrees c. While this might not be as impressive, you have to remember these fans are geared towards the cpu and not gpu. Now after an hour of playing, I switched the unit into manual mode and turned the fans up to their maximum settings. I achieved these results. 102f or 39c on the cpu, and 117f, or 47c on the gpu. I netted an addition 4 degrees f, or 2 degrees c, while getting a 5 degree f drop or, 3 degree drop c on the gpu. While this may not seem like a huge drop, especially at full fan speed, it does prove that this unit is built extremely well. It also proves my suspicions going into this test, that I felt the relationship between fan speeds, was not going to be a huge factor. Just due to the design of the fans, and their placement. Its already built for maximum cooling from the get go, and the addition of speed really didn't effect it at all. It did however effect the noise produced from the unit. I hate to say it but, this unit does add to the noise of your system. In auto mode, you will never have your fans spin up all the way, but you will still hear the radiating noise from it. But you have to consider the noise it is making though. Its not so much the fans that produce the noise, its the exhaust that is the major culprit. Which in my book justify's the additional noise output. But under playing conditions you will not hear the fans, it is only audible when sitting idle in the dashboard. I also have my unit very close to where I sit, when I moved it to my main tv setup area, I did however not hear it at all. You must also consider this fact too, you can now place your 360 in confined area's that you would never have before, and not worry about the cooling of your system. I placed it in a entertainment center I was never able to do before, and the results were the same. So in my oppion this is something that is very easily offset. And very acceptable. Also I was able to lay it down on its side, and not worry about the build up of heat that I once did before. As everyone knows heat rises and I always had my system standing, but now I am able to lay it on its side. Which scores hugely with me. So in conclusion I find this aftermarket cooling solution to be top notch, and the best I have reviewed so far. Lcd unit looks great, the ease of use of the unit is also great. Installation couldn't have been any easier. Noise output, its tolerable but still loud. Large heat sensors, and the inability to place them where you choose. I highly recommended this unit to everyone out there that is worried about there expensive investment, also for those of you that don't trust Microsoft's solution to cooling. This should add some considerable longevity to a heat plagued console.